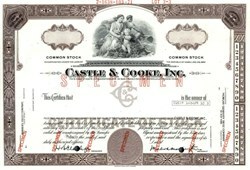 Beautifully engraved specimen certificate from the Castle & Cooke, Inc. printed in 1971. This historic document was printed by the American Banknote Company and has an ornate border around it with a vignette of a family with a hoe. This item has the printed signatures of the Company's officers. Castle & Cooke, Inc., is a Los Angeles-based company that was once part of the Big Five companies in territorial Hawaii. The company at one time did most of its business in agriculture including becoming, through mergers the modern Dole Food Company, the world's largest producer of fruits and vegetables. In 1996 it was spun off from Dole and today most of the company's business is in real estate and residential, commercial, and retail development. Castle & Cooke was founded in 1851 as a partnership between Samuel Northrup Castle and Amos Starr Cooke as a department store that sold farm tools, sewing equipment, and medicine. Joseph Ballard Atherton joined as clerk in 1858 and rose to become partner by 1865. Over the next few decades, the company invested heavily in Hawaii's surging sugar industry, running plantations in Kohala and Haiku. Atherton became president after the deaths of Cooke in 1871 and Castle in 1894, when the company incorporated. After the death of Atherton, George Parmele Castle (1851�1932) became president. G.P. Castle retired in 1916 and Edward Davies Tenney became chairman. In the 1910s, the company, along with three other Big Five companies, invested in Matson Navigation Company. Tenney became president of Matson after William Matson's death. In 1931, the company also bought a 21 percent share of the Hawaiian Pineapple Company, which was later renamed the Dole Food Company. After the death of Tenney, Alexander G. Budge became president in 1935. Castle & Cooke bought the remaining shares of Dole in 1961. Between 1964 and 1968, Castle & Cooke acquired the Standard Fruit Company, adding bananas and other tropical fruits to its existing pineapple operations. In 1976, it acquired Bud Antle Inc., a California-based lettuce and celery farmer; it was renamed Dole Fresh Vegetables in 1989. On May 2, 2012 (made public in June), Oracle Corp. CEO Larry Ellison signed an agreement to buy most of the island of Lanai from Castle & Cooke reportedly for $500 million to $600 million.